If you ever get asked to pick your favourite crime fiction writers, chances are you’ll rattle off a pretty predictable list. Conan Doyle, Agatha Christie, Raymond Chandler, Dashiell Hammett or, for a contemporary flavour, P.D. James and Ruth Rendell. Now, a small group of Indian writers is hoping to work their way around this monopoly. Breaking free from the ghosts of Holmes, Poirot or Philip Marlowe, they are trying to flesh out Indian detectives whose tales of murder and detection are set in the mean streets of Delhi and the murky bylanes of Bombay instead of the alleys of Venice, New York’s Harlem district or that infallible favourite—the English countryside. Mukul Deva’s Lashkar series, Reeti Gadekar’s Man Asian Literary Prize nominee Families at Home, Kalpana Swaminathan’s Lalli series, Jamyang Norbu’s Mandala of Sherlock Holmes, Shashi Warrier’s Sniper and Ravi Shankar Etteth’s The Gold of Their Regrets are in the vanguard of this new trend, and have all caught the Indian reader’s fancy. Some publishers are optimistic enough to believe that we might actually see a proper Indian crime thriller genre emerging out of all this activity. “Initially, publishers were not sure that thrillers featuring Indian detectives would go down well with readers,” says Nandita Bhardwaj, chief editor, Roli Books. “But there is a new confidence that a gripping plot and great storytelling can make a success of an Indian crime thriller.” Riding on this wave, HarperCollins India is slated to bring out two more instalments of Deva’s Lashkar series. Lashkar, the first thriller of the series, sold 6,000 copies and Salim Must Die—the second, published three months ago—has sold 5,000 so far. “The thriller was considered a mass market staple without literary value. But the line between literary fiction and pulp is slowly blurring and more Indian writers in English can feel free to experiment with the thriller genre now,” says V.K. Karthika, chief editor and publisher, HarperCollins India. In doing so, they are charting a path that writers in Indian languages have already traversed, and with great success. As Surender Mohan Pathak, author of over 250 Hindi crime thrillers, points out, with some justification: “Vernacular language writers in India have done a great job of creating unforgettable fictional detectives. While Indians writing in English have been obsessed in wooing a Western readership, vernacular writers give the reader quintessentially Indian characters. This is why a Byomkesh Bakshi or a Feluda live on in our imagination. How can a Bihari or a reader in UP identify with a rehashed version of Holmes or Poirot?” asks Pathak, creator of such colourful fictional sleuths as investigative journalist Sunil and Inspector Devender Kumar Yadav. “Indians writing in English were expected to fill the pages with the aroma of spices, the angst of the diaspora, nostalgia for saris and mango chutney and the tinkle of puja bells,” agrees Kaveri, editor, Blaft Publications. “It didn’t make commercial sense for them to work hard at creating detectives who investigate crimes in the chaos of real, modern India.” To give readers a taste of this missing flavour, the Chennai-based publishing house recently released the English translation of Pathak’s thriller, The Sixty-Five Lakh Heist as well as an anthology of Tamil Pulp Fiction which includes several short crime thrillers familiar to Tamil readers. 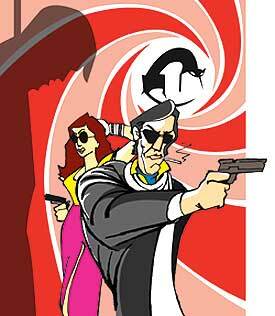 The publishing house also has a translation of Urdu crime fiction writer Ibn-e-Safi’s Jasoosi Duniya in the pipeline. Karthika feels, however, that the new crop of crime writers in English is producing crime fiction that has both literary value and a genuinely Indian quality. That’s true to the extent that some of the new offerings don’t read like formulaic pulp fiction. For instance, Etteth’s The Gold of their Regrets packs in generous literary flourishes as the plot straddles time and space in search of a stolen cache of Nazi gold. Kalpana Swaminathan’s Page Three Murders crackles with wit and energy, as Lalli, an unconventional detective, delves into the dark secrets of Mumbai’s beautiful people. “I created Lalli to assure myself that Mumbai is still a real city, not a masala movie made by an underworld don,” says Swaminathan. “I wanted to give my readers a character who had lived in Mumbai for a lifetime and had not yet lost faith in the city.” In The Mandala of Sherlock Holmes, heinous crime and high intrigue meet the literary worlds of Rudyard Kipling’s Kim and Conan Doyle’s Holmes with panache. “Contemporary India is a treasure trove of stories,” points out Tarquin Hall, a British writer who divides his time between Delhi and the UK. His new crime thriller, The Case of the Missing Servant, is a murder mystery set in Delhi, investigated by the boisterous Punjabi detective Vish Puri and his undercover aides. It lives and breathes the contradictions of globalised India, cleverly weaving in encounters between tradition and modernity into Puri’s capers. “The warmth, humour, brutality and complexity of life here can’t fail to inspire thriller writers,” says Hall. India may be pulsing with inspiration for thrill and suspense, but are desi crime writers prepared to follow the creative spoors? Will they replace, in our minds, images of those pipe-puffing, fedora-crested private eyes walking the darkened streets of a noirish Upper West Side in sodden raincoats? Sharp-witted Lalli or the nitpicking Inspector Nikhil Juneja of Families at Home, or tough as nails ‘demon cop’ Anna Khan of The Gold of Their Regrets may have intrigued readers but it may be a long time before they become cult figures like Hammett’s Sam Spade and Georges Simenon’s Inspector Maigret, or James’s Inspector Dalgliesh in more recent times. “A thriller by P.D. James or Agatha Christie works because it is an excellent character study,” says writer and critic Manjula Padmanabhan. “The settings and the characters are the hook, the murder is incidental. By and large, Indian crime thrillers fail to flesh out credible characters and capture the cultural and social tensions which make the setting of the crime come alive.” So, despite the increasing visibility of the Indian crime thriller on the literary landscape, it may still be a long wait before readers here can urge Holmes to bid farewell to Baker Street and take the 5 o’clock from Paddington, away into a well-deserved retirement.